In game 3 of this Phillies – Nationals series, the playoff-bound Phils looked very relaxed. Joe Blanton pitched 7 fairly easy innings allowing only 3 hits and one unearned run. Blanton probably will not get much playing time in the NLDS as the rotation is set up to include only Roy Halladay, Roy Oswalt and Cole Hamels. So this was a good outing for Blanton to end the regular season with; his final record is 9-6 with a 4.74 ERA. A barrage of home runs from the Phillies bench players helped Blanton out tonight. Taking full advantage of extra playing time, Ben Francisco smashed two home runs and went 3 for 4 at the plate with 3 RBI. John Mayberry Jr. also had a big night with a 3-run homer and a single. Mayberry made vast improvements in AAA this year and is now hitting both right and left handed pitching well. Also joining the home run party was Mike Sweeney; he whacked a long ball to left center in the 2nd. He and Francisco went back to back that inning. 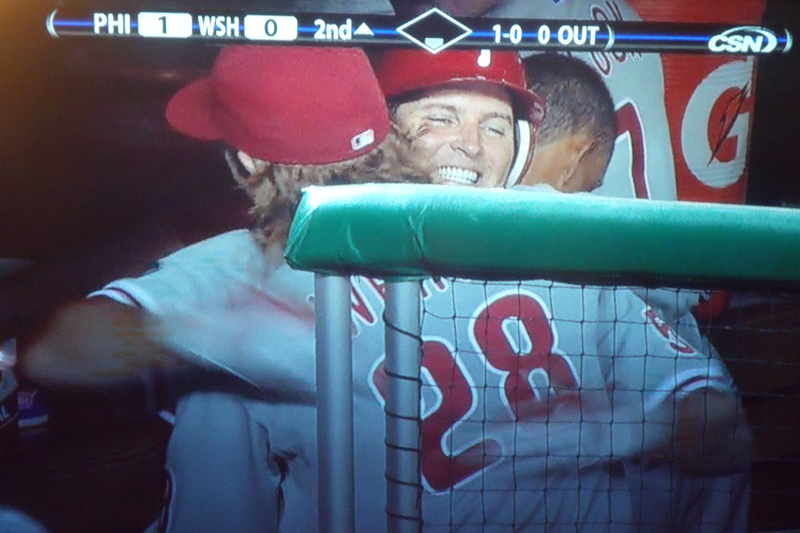 And you know what a Sweeney home run means…HUGS for everyone! If you do not know what I mean, check out my “I Want A Hug From Mike Sweeney” Facebook page. I love watching this guy play; he has brought an exuberance to this team that is rarely seen. It will be a joy to see him in the playoffs, finally, after 16 years in the majors. Catcher Paul Hoover also got some playing time, but went 0 for 4 at the plate. 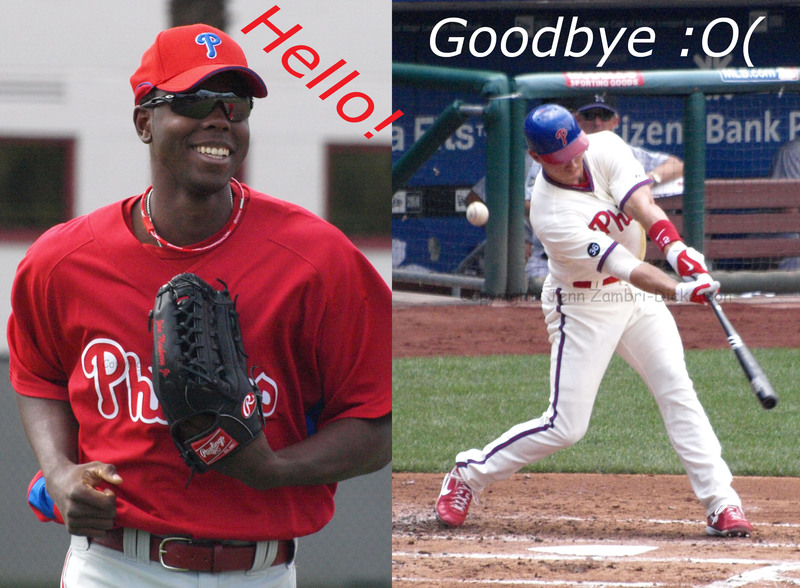 Regulars like Jimmy Rollins, Shane Victorino and Wilson Valdez (a regular due to many injuries) all went hitless. But Greg Dobbs bounced back after a bad game yesterday and had 2 hits. The best pinch hitter in the National League in 2008, Dobbs has suffered a very bad season this year. Maybe this extra playing time will snap him out of the funk. The Phillies went on to win the game by a score of 7-1, giving them a record of 95-64, which will either be the best record in baseball or very close to tied for the best after all the games are done tonight. The Phils are off tomorrow and will return on Friday. The remaining 3 games will be in Atlanta where the Braves are still battling for the Wild Card spot. My day at Citizens Bank Park for the Phillies final home game today against the Mets started off a bit dreary. It was rainy and cold. 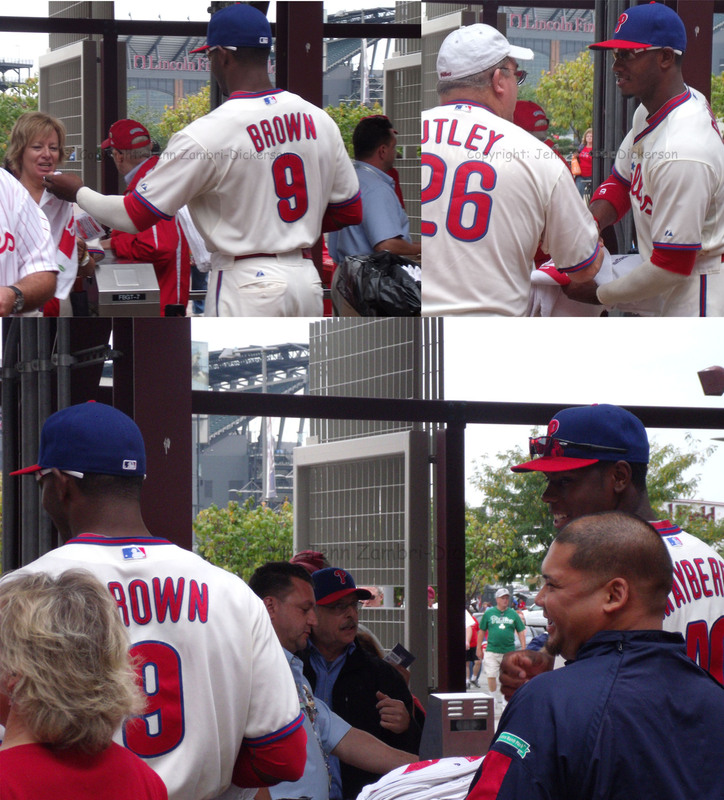 But soon after entering the park, two Phillies players walked right past me; Domonic Brown and John Mayberry Jr. 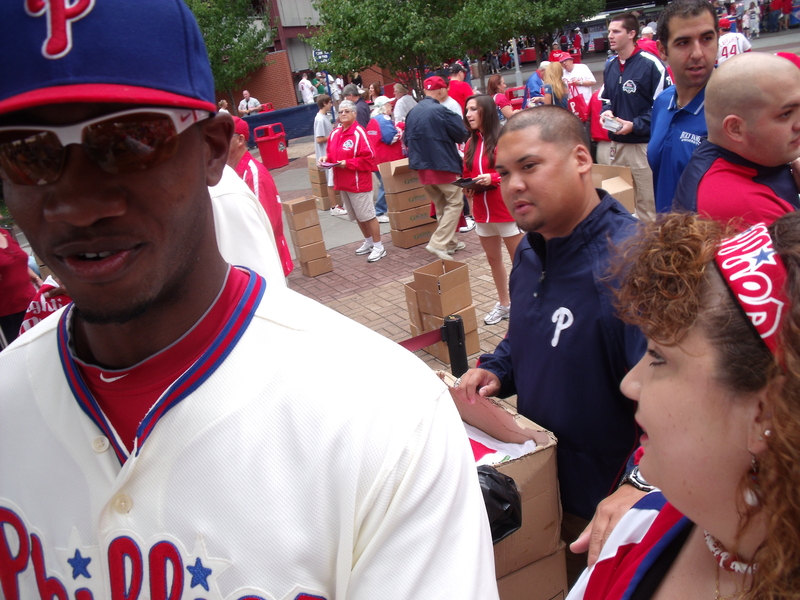 I said, “Hey Dom Brown!” and he said hello back and waved. I then proceeded to follow them through the park. They stopped at the first base gate and began handing out rally towels to fans coming through the turnstiles as part of the Fan Appreciation Day surprises. Once the crowd died down and Brown looked bored, I asked an usher if I could go up close and take a photo. He said I could so I walked over, said hi and asked Brown to take a photo with me. I held up the camera and pushed the button; as I did, two security guards started yelling at me to stop and go away. I turned my head to see what they were yelling about and the shot to the right is the result. Well, at least we are both in it…lol I thanked Dom as I ran off before I got yelled at some more. Down 5-0 in the 5th, things look grim for the Phillies who were getting beat by a very average pitcher in Pat Misch. They finally scored when Chase Utley smashed a 3-run homer. But that was the only highlight of the game as the Phillies went on to leave 9 men on base and were 1 for 13 with runners in scoring position. Defensively, they did at least embarrass Jose Reyes one more time. In all 3 games this series, Reyes was picked off base. Today, he was thrown out at home and also caught stealing third base; Shane Victorino got the assist on the out at home. The Phillies defense also turned one double play while Carlos Ruiz hit into a double play to end a scoring threat in the 4th. This loss was disappointing on many levels. First, the Braves lost which means, had the Phillies won, they could have clinched the NL East at home and the fans, myself included, would have been able to participate in the celebration. Also, it was Fan Appreciation Day which means after the game, the players traditionally would toss t-shirts and signed Nerf-like balls into the stands. But since they lost, they all went to the clubhouse instead of thanking the fans who stayed to the end. The ball girls were left to handle the duty. As the bullpen members walked in, a few of them, like Brad Lidge and JC Romero, stopped and helped out the ball girls, which was nice. But overall, it was a very disappointing day and a letdown for the fans. The good news is, the magic number is now just ONE. So the Phillies only need one more win or one more Braves loss to clinch. Right now, the worst they can do it tie with the Braves for the NL East title. The Phillies go to DC now for 3 games against the Nats; tomorrow’s game time is 7:05pm and Roy Halladay will pitch. Here is the full Photo Album from the game. The Phillies went to Florida today and filleted the Fish with 11 runs scored. The dinner bell rang early as Jayson Werth smacked a solo homer in the 2nd inning to start the feast. The offense continued to rack up runs in every inning from the 2nd to the 7th. Four home runs tonight were a welcome sight; Chase Utley, Carlos Ruiz and Greg Dobbs all followed in Werth’s footsteps after the first bomb in the 2nd. Utley looked very hungry with his homer plus 2 walks. And Ruiz snacked on the Marlins with 3 hits and 4 RBI. Even starting pitcher, Joe Blanton, helped out with a hit and a run scored. Blanton allowed just one run through 6 innings and had a fairly easy time knocking down Marlins batters. With 8 strike outs recorded, the only real disappointment was that Blanton could not go 7 innings. Blanton has struggled all year to get past 6 innings; he has pitched 7 innings or more only 8 times in 25 starts. But with an 11-1 lead in the 7th, there was no need to push Blanton further. The bullpen was fully rested after a Roy Oswalt complete game shut-out yesterday. Jose Contreras pitched the 7th and did well. In his last 2 outings, he allowed 2 runs each game and looked tired. A clean outing tonight was probably a nice confidence boost for him. On the other hand, David Herndon was brought in to get some work in the 8th and got beat up by the angry Fish. He gave up 3 runs, including a 2-run homer. But after he finally got out of the inning, the Phillies still led by a score of 11-4. The Phillies were able to rest some of their regulars near the end of the game, giving bench players like Ben Francisco and John Mayberry Jr. a chance to play. Wilson Valdez is still filling in for Jimmy Rollins who had an MRI on his hamstring today. The MRI showed a slight strain, but no tear. So Rollins should be back in action in a few days. Although, Valdez has been great in his absence; Valdez collected 2 hits tonight. With the Phillies win plus a Braves win over the Nationals tonight, the Phils remain 1 game in first place. 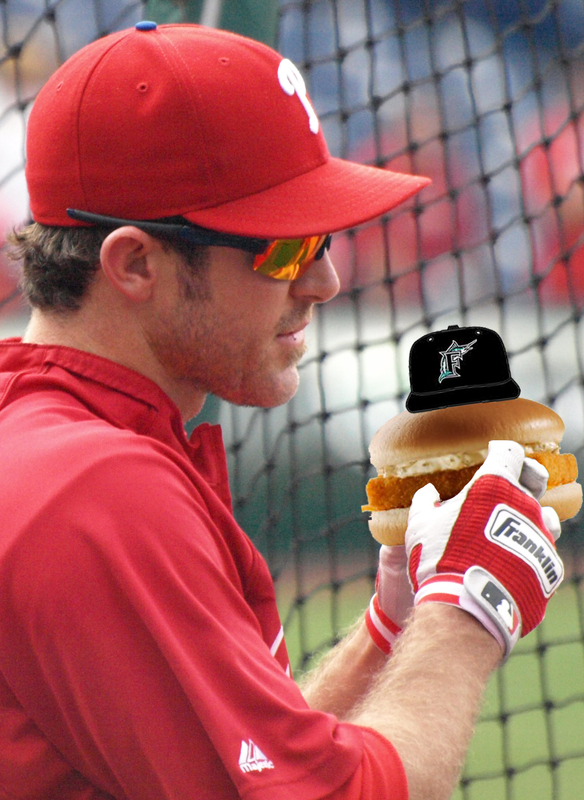 They have 2 more games with the Fish…game time tomorrow is 7:10pm and Cole Hamels will pitch. Part two of the Roy Oswalt – Philadelphia experience tonight went a tad better than the first part. After allowing 4 earned runs in his Phillies debut, Oswalt handled the Marlins pretty well. He struggled with his control at times, which elevated his pitch count, but the end result was positive. Oswalt went 6 1/3 innings allowing 3 hits, 4 walks and 2 runs. The 2 runs however, scored after JC Romero came in to relieve Oswalt in the 7th. Romero allowed an RBI double and then walked the 2nd run home on 4 straight balls. Those runs were both charged to Oswalt. Now, I love JC for his spirit and for the person that he is. But the manager has to know that he gets wild in these situations sometimes. Two runners on and one out is not a good situation for Romero. Then again, with the Phillies bullpen as up and down as it has been, who to bring in and when remains a head-scratcher. Jose Contreras was up next in the 7th and did not fare much better. He immediately allowed a 2-run single. Those two runs were charged to Romero. So the cycle of crap rolling down hill continued as the Phillies lost a 2-0 lead and turned it into a 4-2 deficit in 1 inning. As for the offense, Oswalt did not get much run support in Houston and so far with the Phillies it has not been too different. With the bases loaded in the first and one out, Jayson Werth hit a weak pop fly to strand the runners. 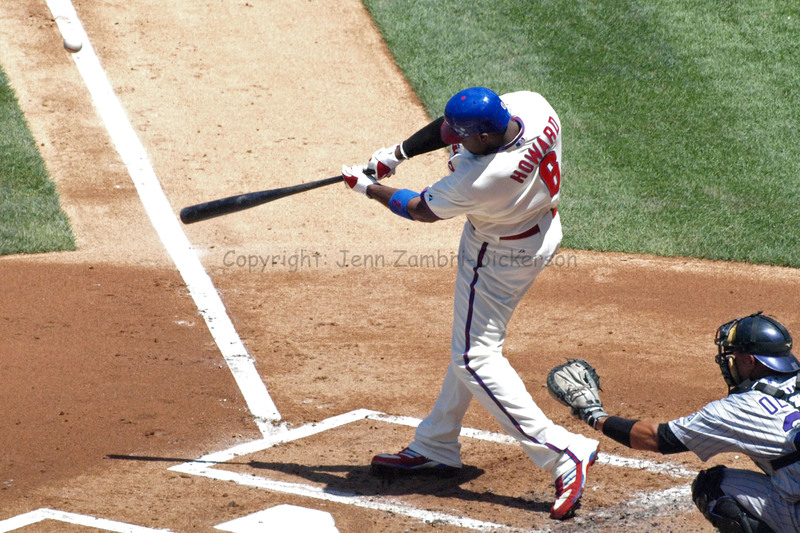 Domonic Brown struck out next, but putting that pressure on the rookie is just unfair. Werth should have been able to hit a sacrifice with only 1 out. More opportunities came in the 3rd inning, but again, Werth stranded 2 more runners and grounded out to end the inning. Carlos Ruiz finally came up with a big 2-out hit in the 6th to score Brown and Raul Ibanez, but no one else stepped up after that, even after Oswalt drew a walk to load the bases. Mike Sweeney saw his first action as a Phillie in the 8th as a pinch-hitter and drew a walk. Nice job! Cody Ransom was designated for assignment earlier today to make room for him instead of sending John Mayberry Jr. back down. Ransom did not play very well, batting only .190 since being called up from AAA. So the Phillies entered the 9th down by two runs. And then the offense started to show signs of life again. Placido Polanco reached on a error which was followed by a Ross Gload single and an RBI-double from the super-hot Ibanez. Werth stepped to the plate again in a good hitting situation and finally came through. A single tied the game at 4-4. But then, just to totally ruin his shining moment, Werth wandered too far off second base and got picked off! A few pitches later, Brown followed in Werth’s not so nimble footsteps and got caught stealing! He was probably trying to make up for Werth’s bone-head move. What a mess…inning over. Ryan Madson held the tie down. Then in the 10th, Ruiz played the hero again and smashed his 2nd homer of the season to give the Phils a 5-4 lead. 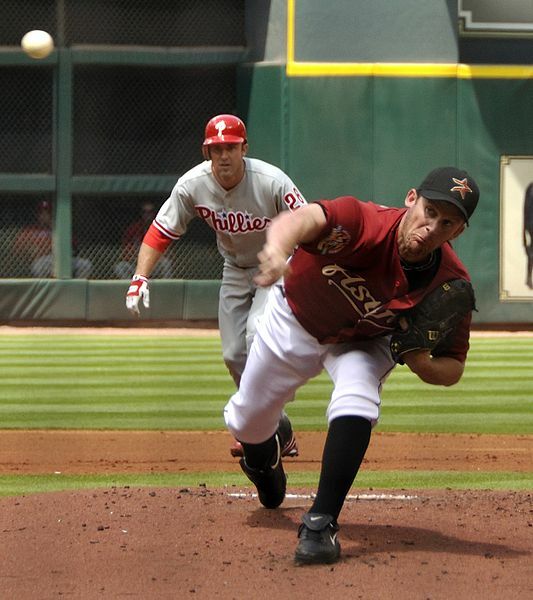 But no sooner could Phillies fans rejoice than we saw Brad Lidge step to the mound with only a 1-run lead. Oh crap….not again. But by some act of God, Lidge got the job done…whew! A SWEEP in Miami! Nice. The Phillies head back home now to play the Mets tomorrow at 7:35pm. Joe Blanton will pitch. Good night all! Is this a sign that 2010 is just not the Phillies year? I hope not. Filling in at first base likely will be Ross Gload and maybe Cody Ransom. John Mayberry Jr. was called up to fill the roster spot and will be used off the bench. Howard and Chase Utley are the Phillies biggest producers; having them both out of the line-up is going to make an already struggling offense even less effective. 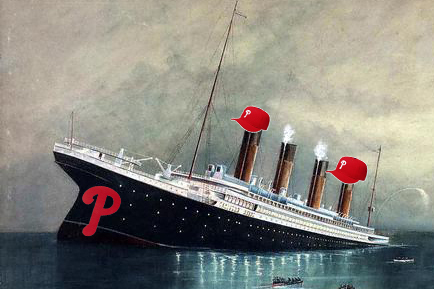 Not to mention, the Phillies bullpen is still suspect. Manager Charlie Manuel has no idea what to expect from the pen from day to day. And with fewer runs being scored, odds are good that the pen is going to decide the outcome of a lot of games. This is not good news. If you are looking for some good news, Roy Halladay is pitching tonight in Miami. Even better news; the last time this match-up occurred, Halladay threw a Perfect Game. The Marlins may be more prepared this time out, but anytime Halladay pitches, you have to like this team’s chances. It has been a while since Phillies fans have been treated to a home run barrage. Tonight, the Phillies embraced the long ball, knocking three 2-run homers out of the ballpark; once each in the 5th, 6th and 7th innings. Jayson Werth got the first one, which had to be a big relief for him. Werth has not hit a homer in over a month, since June 23rd. Ryan Howard and Cody Ransom collected the other two bombs. Cole Hamels had a bit of a rough outing, so the homers were a welcome sight. In the 1st inning with two outs, Hamels allowed a single, hit a batter and walked two more, which walked a run home. In 5 innings, Hamels walked 4 batters, hit two batters and allowed 3 runs. So while he was not at his best, he did still keep the team in the game. David Herndon pitched one inning in relief and had some trouble as well. With one run already across, it looked like Herndon had a ground ball double play to end the inning. Placido Polanco fielded the ball, tagged the runner and tossed to first. But the runner going to second was called safe, despite insistence from both Polanco and manager Charlie Manuel that he did indeed tag the runner. The ump did not see it and another run scored. But the home runs kept coming and the Phillies took the lead right back. Then in the 7th, Shane Victorino caught what appeared to be a routine fly ball but was wincing in pain before the ball even arrived. He called the trainer over and was taken out of the game. The report is that Victorino has a left oblique strain. Oblique strains are tricky so if he lands on the DL, it would not be shocking. What is shocking is that the Phillies cannot seem to catch a break with all the injuries. 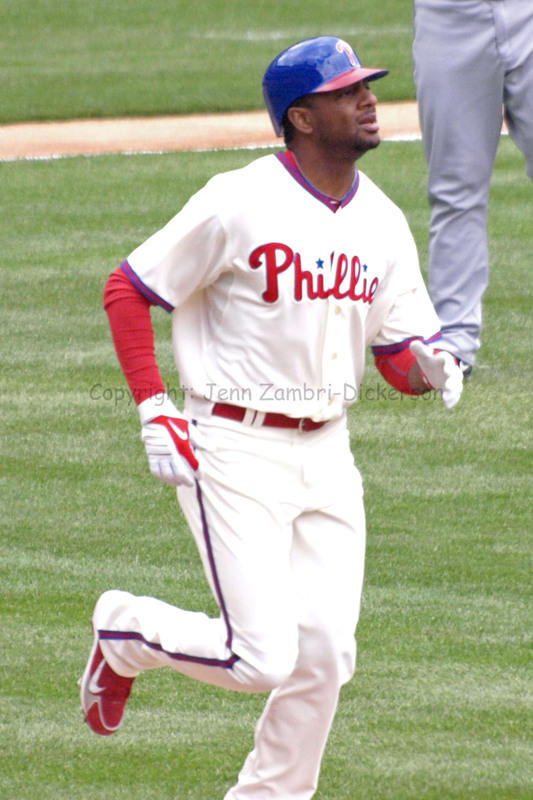 Yesterday, Jimmy Rollins got hurt when he fouled a ball off his foot. He seems to be feeling better, but may still miss another game or two. Now Victorino; plus Chase Utley is still recovering from his thumb injury and at one point, the Phils had seven players on the DL all at once. The injuries are getting old; but the current win streak, despite the injuries, is certainly not getting old. After sweeping the Rockies in 4 games, they beat the D-Backs tonight by a score of 9-5 for their 6th straight win. The rookie Herndon picked up his first major league win. In addition, the Braves lost tonight so the Phillies gain a game on them. The Phils are now 3.5 games out of first. There are two more games with the D-Backs left before the Phillies hit the road again. As for Victorino, we should know more tomorrow. If he lands on the DL, the Phils will probably call up either Domonic Brown or John Mayberry to take his spot. I know everyone will be rooting for Brown, but Mayberry may get the nod because he has already been in the majors and they may not want to start the clock on Brown’s options just yet. But my vote is that Victorino is okay…here’s hoping. While nothing official has been announced yet, it looks like the 5th starters spot will go to Jamie Moyer. Against the Yankees on Friday, Moyer solidified his bid for the job by pitching 6 2/3 scoreless innings and allowed only 1 hit. His overall ERA for spring is now 2.61, if your count all the “B” games he pitched also. Is it possible that this 47-year old man, coming off 3 surgeries in the off-season, is simply just indestructible? Either he is taking Fountain of Youth pills or secretly, he is Superman with the red, white and blue uniform being perfect camouflage for his super hero suit. So Kyle Kendrick will probably start the year in the bullpen and just wait around for someone to toss a huge ball of Kryptonite at Moyer. Either way, Kendrick should be content just to make the team after a young but up and down career so far. Leaving his super hero costume at home, Cole Hamels is still a work in progress. He got beat up on Saturday against the Twins, allowing 5 runs on 7 hits and 2 walks in 6 1/3 innings. While Hamels was pleased that he was able to reach the 90-pitch mark in a game, he still has some big control issues to work out. After the game, Hamels told the press that he is “starting to really feel game-oriented.” With only 8 days left until Opening Day, let us hope that his “game-oriented” compass is pointing towards the strike zone. Another point of concern this spring is Raul Ibanez, who is barely swinging the bat with a paltry .098 average. That is only 4 hits in 41 at bats. Ibanez struggle the 2nd half of 2009 with a hernia that was operated on this off-season. While he recovered well from the operation, he still has not looked at all like the “RAUUUUUL” of old. To make matters worse, he got hit in the right elbow with a pitch on Friday. It may not be a serious injury, but it may be enough that he does not get much more hitting practice before Opening Day. When the Phillies signed Ibanez to replace Pat Burrell last year, many people, myself included, questioned why they signed a player who was 4-years older than Burrell to a 3-year contract. 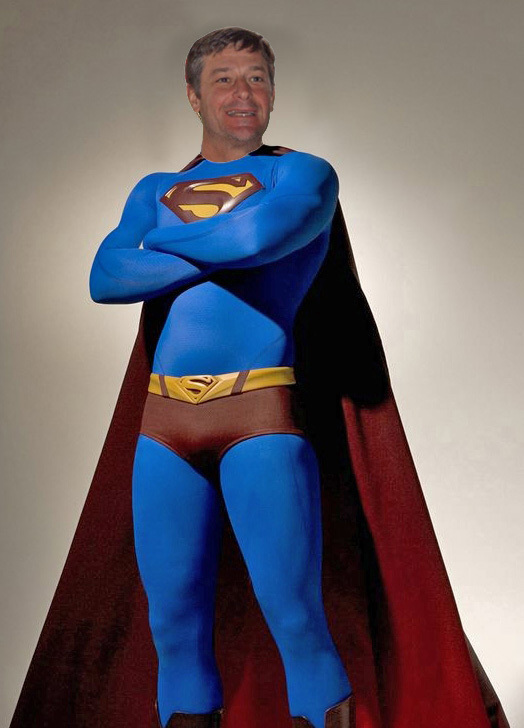 Ibanez will turn 38 in June and it does appear that he is not wearing the same Superman cape that Jamie Moyer is using. Moyer is a freak of nature. Ibanez, however, appears to be a mere mortal. While everyone was thrilled with his performance in the first half of 2009, things went downhill from there and show no signs of improving. Cross your fingers; this could get interesting. The good news is, if one of the outfielders should go down, John Mayberry Jr. is waiting in the wings. Mayberry was sent to minor league camp today, but he had a great spring and would likely be first in line to be brought up if anything goes wrong. Mayberry had 6 RBI, a homer, 3 doubles and hit for an average of .289 in camp. Two more players were reassigned today also; catcher Dane Sardinha and infielder Ozzie Chavez. This means the bench for the Phillies should consist of catcher Brian Schneider, infielders Juan Castro and Greg Dobbs and outfielder Ross Gload. With the 12 pitchers and other regulars, that should complete the 25-man roster.